Samdrup Rinpoche is a contemporary lama of Tibet, holder of the Dudjom Tersar lineage. He was born in 1973. At the time of his conception, his father Tulku Theglo Rinpoche, dreamed of a right-spiraling conch entering the womb. Through this sign, Tulku Theglo Rinpoche realized that his child must be one of the reincarnations of his own father, Dzongter Kunzang Nyima], the speech emanation of Dudjom Lingpa. This recognition was later confirmed by other masters, who added that he was also the reincarnation of one of Dudjom Lingpa's sons. 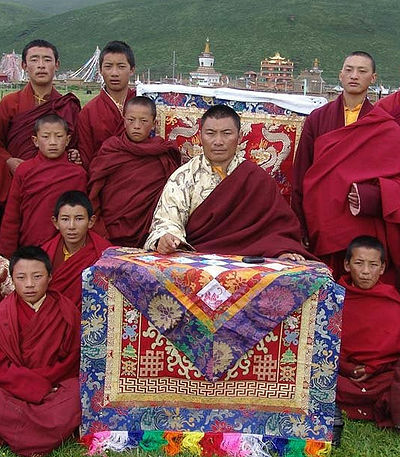 Samdrup Rinpoche‘s root teacher is Khenpo Jikme Phuntsok, who is also his uncle. Samdrup Rinpoche is abbot of Tazi Temple and is fluent in spoken Chinese as he has been teaching throughout China for many years. This page was last edited on 8 May 2014, at 15:25.